Clydesdale Men’s 3s completed the first half of their season by beating Dumfries 1s at Titwood in Men’s West District Division 1A. The game began well with the M3s setting the pace right from the off as they went on to dominate the opening half. 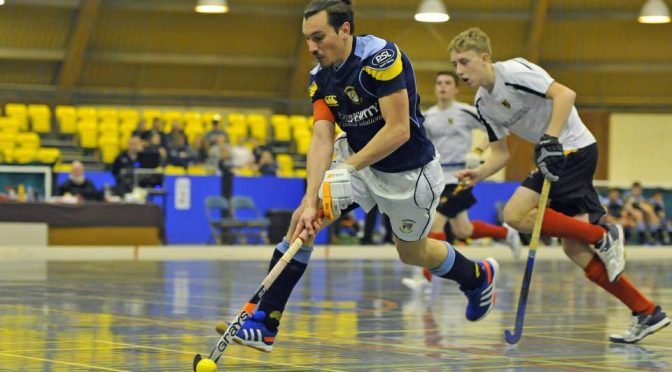 The home side took the lead through Colin Moulson, before doubling his tally in the second half as the M3s continued their pressure on Dumfries. The home side will feel they should have killed the game having won a number of penalty corners throughout that were not converted. So much so, that Dumfries got a goal back from a reverse stick shot with ten minutes to go. The away side stepped up to force an equaliser and almost got it through a corner. But the M3s held their nerve to take the three points and seal their third win in four games. The result keeps the M3s fourth in Men’s West District Division 1A. Veteran Gill Green inspired Clydesdale Western 3s to a 4-1 win over George Heriots FP 1s at Titwood in Women’s Championship Division One. The L3s bounced back from their defeat to George Heriots a few weeks back scoring goals through Green twice, as well as Claire MacDonald and Sharon Duncan. The result means the L3s are clear in fourth place in Championship One and are a point behind Clydesdale Western 2s. Clydesdale Western’s 5s continued their excellent season in Women’s West District Division Two with a hard fought win at home to Argyle 1s. The two sides had already played each other in the opening weekend of the season, having drawn 0-0 back in September. And unsurprisingly, it was another even contest but the L5s got the only goal of the game through youngster Alessia Martinolli to take all three points. The win keeps the L5s in sixth in Division Two, with clear day light between themselves and seventh placed Kelburne 3s. Clydesdale Western 6s difficult season continued as they were torn apart at Upper Windyedge to Hillhead 4s. Despite goals from Rachel Brewer and Daria Martinolli, the L6s lost out 10-2 and remain in the bottom two of Women’s West District Division Three. Clydesdale Men’s 5s visit to Dumfries 2s for their Men’s West District Division Three clash was postponed for the second time due to a waterlogged pitch. Overnight rain left the King George V Playing Fields unplayable. The two sides will look to reschedule to play at a later date. Clydesdale Men’s 2s got their indoor campaign off to a magnificent start as they secured wins against Falkirk & Linlithgow 2s and Watsonians 2s in Forthbank, Stirling. All the more impressive was that the M2s did it without a goalkeeper as there young side got their season in Men’s Indoor Regional Division One off to a flyer in game one against Falkirk & Linlithgow with a 12-5 win. The M2s then completed their day with a second three points – a 9-4 win against Watsonians 2s.